The Chihuahua al Pacifico (“El Chepe” for short), Mexico’s Copper Canyon rail-road, is among the world’s most spectacular train journeys. One of only two passenger routes in the country, this 650 km (~404 mile) “ride in the sky” takes 13 hours to wind its way northeastward along the Sierra Tarahumara (part of the Sierra Madre Occidental mountain range). The journey runs from Los Mochis on the northwest coast to Chihuahua in central northern Mexico, rising from sea level to almost 2,500 meters (~8,000 feet) at its highest point. A masterpiece of engineering, the railroad took a century to construct. It was originally conceived in 1861 by American civil engineer Albert Kimsey Owen, and the last section was finally completed 100 years later in 1961. El Chepe was launched shortly afterwards by the (then) state-run railroad and has remained a popular tourist train for more than 50 years. TripAdvisor reviews pay testament to its enduring popularity and awe-inspiring vistas. Since the privatization of Mexico’s rail system in 1998, the route has been run by giant rail conglomerate Ferromex, the bulk of whose business comes from freight transportation (it carries more than half of all cargo transported in Mexico). It’s fair to say El Chepe has not been a strategic priority for the company over the past two decades. By 2017, the train was showing signs of age: the dining car was quite basic and the well-worn seats in the passenger cars reportedly weren’t as comfortable as they might have been, especially on some of the route’s bumpier sections. Yet while El Chepe may not be able to match the money-spinning potential of Ferromex’s core freight business, it continues to hold a special place in the hearts of managers and employees, as well as among tourists and the wider public. So the company decided it was time to make the train as sumptuous inside as the view from the windows. But when representatives from Ferromex walked into his showroom last year, it was to be the start of a project like no other. Wowed by the smart technology on display, the rail giant was intrigued to find out whether and how it could be adapted for El Chepe. It wanted to offer passengers not just a comfortable ride, but the ability to enhance their journey with information that would give them an even deeper appreciation of the experience. 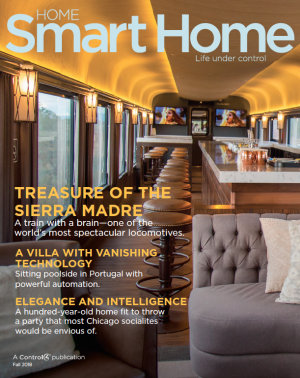 “Although they didn’t have a precise idea how smart automation could best help, they knew they wanted to go beyond the basic audio system on the original train and asked us to come up with some ideas,” says Mizrahi. MEXICO’S MUCH-LOVED TOURIST TRAIN, EL CHEPE, EVEN KNOWS WHERE IT IS AND CAN SHARE ON-SCREEN STORIES ABOUT ITS SURROUNDINGS TO ENLIGHTEN AND DELIGHT PASSENGERS. What Ferromex knew passengers did want, however, was an informative guide to their journey. There are so many stories to tell about the route—from the geological formation of the gold-and-green Copper Canyon, to tales of the shy indigenous Rarámuri people who dwell in remote villages high in the canyons and can reportedly run for hours up near-vertical slopes. Could Control4 México help Ferromex bring these and other trip-enriching stories to life for passengers? Mizrahi proposed a novel solution. By using a technology known as “geofencing,” the train would know when it had passed from one part of the route to another and trigger relevant videos to be shown automatically on screens in each of the rail cars. Being such a large company, Ferromex already had sufficient in-house expertise to create a compelling range of audiovisual content to bring the route to life. “We’d not done anything like this before, but I managed to find and set up a great independent product that uses geofencing to trigger the right videos at the right points on the journey,” says Mizrahi. Meanwhile, Ferromex commissioned its in-house design team to completely remodel and modernize the interior of the rail cars, working alongside a team of six people from Control4 México to ensure all the tech was seamlessly integrated into the design. The pilot project encompassed nine rail cars—six passenger cars, a bar car, a two-story dining car, and an uncovered terrace car where passengers can admire the spectacular scenery in the open air. “The new interiors are stunning. The refurbished rail cars now look more like the inside of a luxury private jet,” says Mizrahi. Roomy, chocolate- brown leather seats complement a wood-finished interior in multiple tan tones that exudes natural warmth, comfort, and sophistication. In the bar, passengers can relax in one of the sumptuous curvy couches or hop on a sprung, leather-seated stool around the impressive marbled bar. Meanwhile, the luxury dining car invites passengers to enjoy a meal at their leisure sitting at the large wooden tables while the scenery whizzes by. Much of the technology is hidden, but any that’s visible only enhances the smooth elegance of the design, while simultaneously adding a splash of modernism. Wall-mounted smart lanterns and flush-mounted smart ceiling lights throughout the train can be remotely controlled or set to automatic lighting scenes that suit the time of day and location. Every rail car also has giant, pin-sharp screens, as well as an integrated audio and PA system, security cameras, and automated temperature control. Typically, Control4 México installs smart tech in private homes, restaurants, shops, and hotels. It has worked on projects ranging from $1,000 to $5,000,000 and has a wealth of experience managing different types of smart automation installation. Kitting out a train presented a whole new set of challenges, however. For one thing, buildings stay where they are. You can wire one room to another, safe in the knowledge that no one is going to swap a couple of rooms around or remove them completely because the house isn’t full of people. And bar the odd power cut, buildings pretty much always have access to the juice they need to keep their technology running. The initial project to kit out all of the rail cars on one of the route’s nine trains was completed in January at a total cost of just $150,000. Chepe staff have a Control4 touch screen that lets them play music, operate the PA system, adjust the lighting and temperature, play content on the screens, and monitor the security cameras. They also have a smart Control4 keypad that allows them to trigger predefined scenes. For example, there’s a “welcome” scene that switches the lights on and plays an introductory video before the train sets off,” says Mizrahi. WANT TO LEARN MORE ABOUT SMART HOME SOLUTIONS? FILL OUT THE FORM BELOW AND WE WILL SEND YOU MORE INFORMATION.